I'll post an update this weekend with all the updates we've had over the past week. - There are no longer Progression Server specific spawns in open world zones for Classic, Kunark, Velious, or Luclin bosses. These bosses now spawn at an accelerated rate on all servers, roughly twice the rate that they previously spawned on Live servers. Fabled versions of these NPCs should now work correctly on Progression Servers. - Added several statless mounts to the Marketplace for progression servers. - - These new mounts are available for purchase starting with the unlock of Shadows of Luclin and will remain available until Omens of War unlocks, at which point standard Marketplace mounts become available for purchase. - - These new mounts are equivalent in speed to silk bridles. - Removed the race specific restrictions on evolving items obtained from The Burning Lands. These evolving items will now gain experience from any experience-giving NPCs slain in The Burning Lands zones and Gnome Memorial Mountain. - Increased the range that direct-damage and damage-over-time spell messages are reported from 75 feet to 200 feet. - Added the correct version of Soothing Breath to Transverse Yaw Stabilizer and Mana Battery Pendant. - Fate's Accumulator and Blazing Utopia augments now drop in all The Burning Lands raid zones. - - The chance for each of these to drop per kill has been reduced. - Fixed the spelling of Exceptional-Quality Scrap Metal. - Removed the extraneous quest flag from the book Revenge on the Fallen. - Added a minimum level to trigger combat activated spells from a handful of weapons and augments that lacked an appropriate required level. - Added Cleave and Ferocity to The Burning Lands Cleric armor, and Ferocity to Shaman armor. - Added a chance for NPCs in some The Burning Lands zones to drop Whispering Midnight augments. - Added the appropriate click spells to The Burning Lands evolving ring and shoulder items that offer rewards. - Changed the cast proc of Ascending Sun Devotional Staff to Sympathetic Arms of Holy Wrath VI. - Attached the correct recourse to the Hand/Arms of Holy Wrath VI spells. - Fixed the roman numeral in the name of Arms of Holy Wrath VI Recourse. - Minion of Darkness effects will now work on Beastlord warders summoned between levels 56 and 75, when they previously only worked on warders summoned between levels 66 and 75. - Beastlords can now use the Gloves of Dark Summoning. - Added Ring of Scale power sources to The Burning Lands rares, and some basepop. - Sixth Anniversary Scavenger Hunt - Fixed a bug that prevented the Collector's Drachnid Web Sac from dropping from Dreadlands drachnids. - Bristlebane Events - These events will run for two more weeks in late April this year. The Mischief continues! - This Ain't Right - Bristlebane will appear when needed again. - Danger Zone - Player spells will no longer heal ballistae. - Danger Zone (Group mission) - It's again possible to request this task. - Danger Zone (Group mission) - This task now allows up to 6 characters and mercenaries to participate. - Dragon in the Works - Changed some of the warnings to use user event colors, and made the dragon immune to knockback effects. - Dragon in the Works - Added an enrage mechanic. After 30 minutes of fighting, the dragon will grow stronger. - Mechagnomic Whirlrender - Added an enrage mechanic. After 30 minutes of fighting, new enemies will begin to spawn. - Mechagnomic Whirlrender - Added logic to prevent the boss from being stuck in the sky. - Ironing Out the Legion - Allowing the Legendary Clockwork to be activated no longer has a chance to prevent the task from updating. All debuffs on the busy mechanics in the furnace room will be removed when they go back to work. - Ironing Out the Legion - Added loot to Consul of Cooperation. - Night at the Museum - Added a delay between when you get the warning that the roboboar is chasing you and the boar slams into you. This should allow you to get away if you are standing next to the boar when you get the warning. - Night at the Museum - Fixed an issue that could cause the rattling roboboar to kill a seemingly random character when it starts its chase. - Night at the Museum - Fixed a problem that prevented two of the large gold statues in the museum from respawning after an event reset. - Trial of Stoning - Fixed a problem that was preventing the pitiless avengers from shooting the accused prisoners during the trial. - Defending Knowledge - Removed erroneous particles from the zone. - - Lowered the boss's regeneration slightly. - - Increased the damage done to mephits by bane abilities slightly. - - Increased the amount of time between mephit waves in the final phase of the encounter. - - Increased the amount of time between armor suit waves in the final phase of the encounter. - - Decreased the number of mephit spawns per wave in the final phase of the encounter. - The Mechanical Fortune Teller will now mention the cake-eating challenge if queried for details of 20th Anniversary events. - Added rewards for the 20th-anniversary challenge and some Gnome Memorial Mountain achievements. - Damage-over-time spells once again display a twincast message when the spell first lands, and no longer reassociate with their caster if they zone or die. - PvP: Damage shield damage received from attacking players will now deal a maximum of 5% of the attacker's health per hit. Damage shield damage received from non-player targets is unchanged. - Beastlord - Ogre Beastlord warders are now a little bit larger by default. - Ranger - Corrected the name of the Irae Faycite Shard that adds damage to the Hornet Swarm spell. - Enchanter - Adjusted the stacking of Night's Endless Terror to better coexist with a number of other abilities. - Druid - Lowered the required level to cast Zephyr: Lavastorm to 47. Lowered the spell difficulty and price. Moved the scroll from Wanderer Frardok to Wanderer Qenda. - Reduced the effectiveness of Crippling Snare. - All racnors are now racnars. - Added coin to Gnome Memorial Mountain NPCs. - Tinzenwen Geargoggler has now been given the title 'Overseer of Repairs'. - Increased some of the statistics of The Burning Lands mercenary items. - Agent of Change instance in Great Divide - The 10th Ring War is now started by handing in the Declaration of War and the Coldain Hero's Insignia Ring to Sentry Badain in the instance. - The Blade of the Black Dragon Eye will be available for a brief period starting a few weeks after Ruins of Kunark launches. - Fabled NPCs are now eligible to spawn in Agent of Change instances. - Added the appropriate teleportation item to Collectors of Transference in the Nexus and Overthere on Selo. - Added vendors in Overthere and Firiona Vie that sell melee tomes for disciplines that were previously available in Kunark as commands. - Updated the dates for Legend of Ykesha unlock to run on the same day as the Planes of Power unlock on Mangler. - - Ruined Blackburrow Gnoll Pelt drops have been restricted to the unlock of Planes of Power. - - Scalded Rat Skin drops have been restricted to the unlock of Gates of Discord. They will now only drop from rats in Dagnor's Cauldron. - - Essence of Shadow, Moonlight, Sunlight, and Winter drops have been restricted to the unlock of Shadows of Luclin. 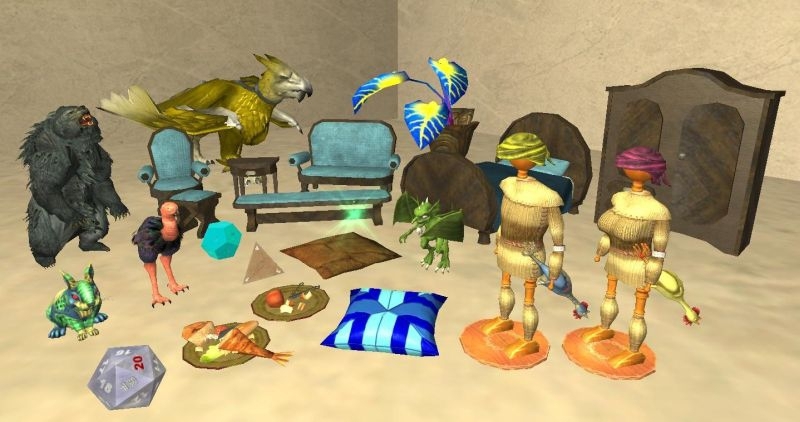 - - Quest drops for Escape to Norrath tasks no longer drop until Dragons of Norrath has unlocked on the server. - - Many quest items for Planes of Power era newbie quests no longer drop until Planes of Power has unlocked on the server. - - Removed many Planes of Power era quest items from low level zones. - Corrected an issue where /nod would cause you to disagree wholeheartedly (/no). - Players who log in on their character's birthday will have a rainbow colored name for the day. Updated the /played command to include your age in Norrath. - Fixed spelling and grammar errors in the 20th Anniversary achievement challenge. - Fixed an issue with the Rallos Zek Puppet's name changing back after using a Potion of Familiar's Amnesia to change its name. - Attempting to open the Faction Window while shrouded will no longer cause a client crash. - If a task rewards a faction change, the Task Window will now correctly link to that faction in your Faction Window. - Disabled the context menu to move the main chat tab into another chat window. - Fixed an issue that prevented audio triggers from matching text that contains formatting data such as spell or item links. - Riposte messages are now reported before their resulting hit damage. - Added the ability to customize the color that chat windows are highlighted with when displaying a new message. - Dealing direct-damage with spells now reports the caster as 'You' rather than your name. - Fixed a messaging issue where non-song spells activated by bards would report as the bard 'singing' the spell. - Moved spell reflect messages to the spell failures chat filter. - - Spell interrupts, fizzles, and reflect messages now contain the name of the spell that failed. - - Messages indicating the start of a spell cast now include a link to the spell description. - - Messages indicating that a spell has worn off now include a link to the spell description. - - The spell name in damage reporting messages will now function as a link to the spell description. - Fixed an issue that caused the Tsaph Katta Leather Ornaments set to glow neon blue. - Fixed an issue where characters would fail to create but the name would still appear in use. - Gnome Memorial Mountain - Removed chance that some items could spawn where characters could not go at the lowest level of the zone. - Gnome Mountain Raids - Fixed some errors that were preventing travel between the raids. - Gnome Mountain Raids - NPCs will no longer drop loot that they were not intended to drop. They will also not remain to hold loot between events that they should not. - Increased the AA experience rate on Selo. On Wednesday, June 5, 2019, characters on the Fallen Gate server will be merged onto Antonia Bayle. Character transfer tokens will be handed out to all characters on Fallen Gate on April 16, 2019 for those interested in making a move prior to the merge. In order to make the transition as smooth as possible, we've pulled together an FAQ that will help answer questions you may have about the merging process. If you have any additional questions about the merging process, please let us know on the forums! We'll keep the FAQ section below updated accordingly. Kabcar Trapitsa <Sootfoot Family Favor Vendor> has been reminded how much the Drakota Bone Trophy, Lava Blossom, and Lava Crystal are worth. He is willing to sell them, once more! Players who have previously purchased Lifetime Memberships will fulfill the requirements for being a current All Access Member and will be able to send gifts as long as their account age has surpassed 1 year.